Wader is a common term in ornithology for birds which walk about in shallow water. Sometimes they are called shore-birds. They are members of the order Charadriiformes, which are water birds. The Charadriiformes also includes marine-going seabirds with webbed feet. The evolutionary relationships of these birds are very complicated. Most waders live in wetland or coastal environments. Many species of Arctic and temperate regions are strongly migratory, but tropical birds are often resident. Some of the Arctic species, such as little stint, are amongst the longest distance migrants, spending the non-breeding season in the southern hemisphere. Most species eat small invertebrates picked out of mud or exposed soil. Different lengths of bills allow different species to feed in the same habitat without direct competition for food. Many waders have sensitive nerve endings at the end of their bills which let them detect prey hidden in mud or soft soil. Some larger species, especially those adapted to drier habitats, take larger prey like insects and small reptiles. 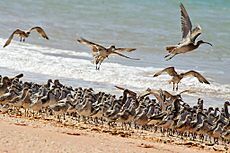 Many of the smaller species found in coastal habitats are often called "sandpipers". 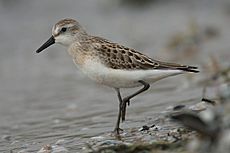 The smallest member of this group is the least sandpiper, small adults of which can weigh as little as 15.5 grams and measure just over 13 cm (5 inches). 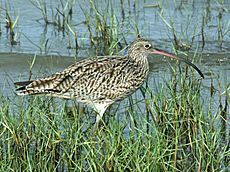 The largest species is believed to be the Far Eastern curlew, at about 63 cm (25 inches) and 860 grams (1.9 lb), although the beach thick-knee, is the heaviest at about 1 kg (2.2 lb). Wader Facts for Kids. Kiddle Encyclopedia.